The Goose Creek Meetinghouse Complex is a Quaker worship center, with an original 1765 meetinghouse, an 1817 meetinghouse, and the Oak Dale schoolhouse in the village of Lincoln, Virginia. The 1765 meetinghouse is a one-story stone building. The 1817 meetinghouse was originally built as a two-story brick building, but was damaged in a windstorm in 1944 and its upper story was removed. The schoolhouse is a one-story brick building on a stone foundation, built in 1815. The complex is on the site of the original log meetinghouse, built about 1750. 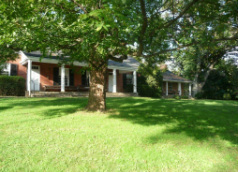 The Oak Dale School was the first public school in Loudoun County, Virginia, and following the American Civil War was the first school in the region to offer education to African-American children. The 1765 meetinghouse was converted to a residence after the construction of the 1817 meetinghouse. The complex was listed on the National Register of Historic Places on July 24, 1974. The Goose Creek Meetinghouse complex and the village of Lincoln lie within the Goose Creek Historic District, a rural landscape district.